Aidan Sullivan (No. 11) lands on our list after leading Scituate to its first sectional crown. As the weeks have gone on, SuiteSports' list of MIAA Football Player of the Year candidates has grown as players have entered their names into contention. We began with five candidates, but players have had the opportunity to add their name to the list on a weekly basis. This week, we have made our final three additions to the list bringing the total number of candidates to 14. We will release our five finalists for the award on Monday of Super Bowl week. Here is SuiteSports' updated list of MIAA Football Player of the Year Candidates as selected by our panel of writers, correspondents, and editors. Everett may not be on its way to wining a third consecutive super bowl, but there is little doubt as of this moment as to the identity of the top talent in Massachusetts. A Michigan commit, Sainristil continues to perform at an exceptionally high level using his speed, athleticism, and big play ability to blow away the competition on a weekly basis. Sainristil's capabilities were on full display in the Crimson Tide's win over Acton-Boxboro on Friday night in which he had this incredible, 74-yard touchdown catch and run. For the season, Sainristil has 36 catches for over 900 yards and 12 touchdown receptions while on the ground, he has rushed for 249 yards and four additional touchdowns. Defensively, meanwhile, Sainristil continues to show why he is widely considered the top defensive back in the area with six interceptions. McElroy has North Andover headed to the Div. 2 Super Bowl with his performance on Friday night putting an exclamation point on the Scarlet Knights dominant run through Div. 2 North. In North Andover's 42-0, sectional final win over Lincoln-Sudbury, McElory finished 4-of-7 through the air for 129 yards and a touchdown. The senior also added 38 rushes and a second score on the ground. Continuing to serve as one of Massachusetts' top dual-threat quarterbacks, McElroy has shown throughout the season an ability to adapt to the way defenses game plan for him. Heading into North Andover's Thanksgiving Day bout with Andover, McElroy has 1,417 passing yards and 16 touchdowns to go with 290 rushing yards and three more scores. Xaverian's reign atop Div. 1 South came to an end on Friday night with the Hawks falling to Catholic Memorial, 25-14. Despite the loss, there is no question Masse has been one of the most valuable players in Massachusetts on both sides of the ball in 2018. In the loss to Catholic Memorial, Masse wracked up 87 rushing yards, a touchdown, 13 tackles, and a forced fumble. Heading into Xaverian's battle for the Catholic Conference crown with St. John's Prep at Fenway Park, Masse has 72 tackles, 5.5 sacks, and four forced fumbles on defense. Masse has also been used out of the backfield on a number of occasions as the Hawks stick to their ground-and-pound ways. So far, he has 370 rushing yards, 71 receiving yards, and 12 touchdowns. Ford's has been sidelined due to injury for most of the last two weeks, suffering a first quarter injury in Mashpee's sectional semi-final loss to Cohasset. Over the last four years, Ford has been the face of a Mashpee program that has been one of the top in Massachusetts. His play helped guide the Falcons to three Super Bowls and a number one seed in 2018. For the season, Ford now has 20 total touchdowns, five games of 110 yards or more, and six interceptions. Shrewsbury's run to a second Super Bowl in three years came to a halt on Saturday afternoon as the Colonials fell to St. John's Shrewsbury. There is little question, however, as to whether Campanale is one of the top quarterbacks that Massachusetts has to offer. In the loss to St. John's, Campanale finished 14-of-21 for 175 passing yards and a touchdown. He also added a 53-yard touchdown run. Through 10 games, Campanale has 1,407 passing yards, 13 touchdowns, and a 67-percent completion percentage. He has totaled 432 rushing yards and has eight additional scores on the ground. Campanale's production has led Shrewsbury to a 7-3 record. One of the top playmakers in Massachusetts, Smith has proven to be uncoverable for most opposing defenses. In Needham's loss to BC High in non-qualifier action on Friday, Smith added to his impressive season hauling in four receptions for 55 yards and a touchdown. Smith's most impressive performance of the season came in the Rockets Div. 1 South Sectional Semi-Final loss to Catholic Memorial. Smith had seven catches for 179 yards and two touchdowns including a 90-yard touchdown reception on Needham's first drive of the game. The six-foot five-inch, 225 pound hybrid tight end/wide receiver has proven to be unstoppable for the majority of the 2018 campaign. Through 10 games, Smith has 55 receptions for 1,035 yards and 11 touchdowns. Holliston's playoff run ended earlier than expected as the Panthers fell in the Div. 5 South Sectional Semi-Finals to Scituate. Elliot, however, has without question been the top two-way lineman in the state this season. The Harvard bound Elliot has been dominant on both sides of the ball, helping to lead the Panthers to an overall 9-1 record and a TVL Large title. Offensively, he has proven to be a valuable piece both in Holliston's up-tempo spread attack and in the Panthers ability to run the football. Defensively, meanwhile, his 6-foot-3 inch and 270 pound frame helps him overpower opponents, making him a force as a run stopper and also a consistent threat to get to the quarterback. For the second time in three seasons, Duxbury will play for a spot in the Super Bowl with Roberts at the forefront of the Dragons success. In the Dragons 21-6 win over Patriot League Keenan rival Hingham in the Div. 3 South Final, Roberts threw for 93 yards and two touchdowns while also adding 108 yards and a score on the ground. Roberts has been terrific all season long, leading the Dragons to a spotless 11-0 record, another Patriot League Keenan title, and the the Div. 3 South title. His play unmatched by nearly anyone in Eastern Mass., Roberts is the definition of a dual-threat quarterback. As a passer, he has 1,398 yards and 16 touchdowns. On the ground, meanwhile, Roberts has 854 rushing yards and 12 more scores. All told, Roberts has 2,252 total yards and 28 touchdowns. Entering the season, Cassell was largely regarded as one of the top tight ends in the region but his candidacy has only been bolstered in recent weeks by his play on defense. In helping to guide Hingham to a berth in the Div. 3 South Sectional Final, Cassell wracked up over 40 tackles and nine sacks while serving as a defensive end. Utilized as a more traditional tight end, Cassell has proven invaluable on the offensive side of the ball. He often uses his six-foot seven-inch frame to transform into an extra offensive linemen for the Harbormen who heavily rely on their ground game. When used in the passing game, Cassell's ability to high point the ball has allowed him to dominate over opposing defensive backs. The Harvard commit has seven catches for 147 yards and one touchdown. In St. John's sectional final win over Shrewsbury, Brunelle showed once again why he is widely considered one of the top offensive weapons in Massachusetts. Brunelle finished with six catches for 78 yards and two touchdowns as the Pioneers defeated Shrewsbury, 41-23. Brunelle has been a standout weapon for the Pioneers from opening night supplanting himself as a top option for one of the most prolific offenses in the state. Even when star running back Eamonn Dennis was sidelined due to injury, the Pioneers' offense largely did not skip a beat and that can be brought back to the production of Brunelle. His talents as a route runner, his hands, and his presence as a vertical threat have helped make St. John's one of the top offenses in Massachusetts. Through 10 games, the junior has 54 catches for 956 yards 15 touchdowns. Springfield Central is one of the most dangerous teams on both sides of the ball in all of Massachusetts and a crucial member of its core is Dancy. While Dancy provides the occasional burst on offense, averaging 37.5 yards per carry and possessing a pair of touchdowns, its his stellar play at defensive back that makes him one of the top players in the state. His athleticism, speed, and ability to read the opposing quarterback make him a nearly impossible player to beat in coverage. More impressive is the fact that Dancy has become so dangerous in pass protection that most quarterbacks do not even look his way anymore. When quarterbacks have tested the senior, they have largely been unsuccessful. Dancy has a pair of interceptions and over a dozen pass breakups on the season. The Golden Eagles clinched their second consecutive Div. 3 West crown on Friday, defeating Westfield 22-0. As Central is set to play in the Div. 3 West Final this weekend, Dancy holds offers from 10 Division 1 programs. Following in the footsteps of Steve Bucciaglia, Schofield has had an impressive junior campaign in helping to lead St. John's to the Div. 3 State Semi-Finals. Over the course of 10 games, Schofield has thrown for a state leading 2,648 passing yards and 34 touchdowns. On the ground, meanwhile, Schofield has rushed for 392 yards and eight more scores. In leading St. John's prolific offense to the Central Mass. crown, Schofield threw for 550 combined yards in two sectional postseason games and eight total touchdowns. Doherty may have lost to Shrewsbury in the opening round of the Div. 3 Central tournament a few weeks ago, but there is little debate over whether Vassar is one of the top talents in Massachusetts. While not overpowering, Vassar is electric as a runner as he uses his speed, quickness, and athleticism to dance around opposing fronts and break away from defensive backs. As a running back, Vassar has 879 rushing yards and 14 touchdowns. The Highlanders have also used the senior in their passing attack and Vassar has taken advantage adding an extra 199 receiving yards and three more scores. Not only is Vassar a weapon out of the backfield and in the open field, but he is also a star in the secondary as evidenced by his three interceptions on the season. 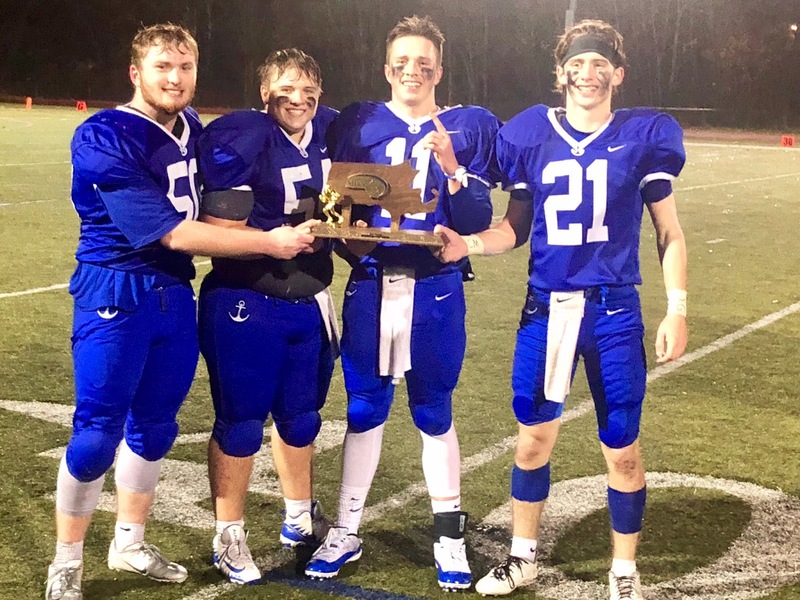 On Friday night, Scituate captured its first sectional title in program history defeating Canton, 21-0. While Sullivan may not have been the lone star on Friday, he has been the face of the Sailors success in 2018. That was on full display in the Sailors opening round win over Dennis-Yarmouth in which the senior quarterback led his team on a game-winning, 97-yard touchdown drive with less than three minutes to play. Sullivan found Jack Ruble for a 10-yard touchdown before running in the go-ahead two-point conversion. In helping to lead the Sailors to a 9-1 record and the aforementioned sectional crown, Sullivan has thrown for 1,875 yards and 19 touchdowns. As a runner, the dual-threat has added six more scores.